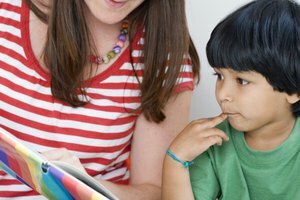 One-on-one reading time with a teacher or parent helps support a young child's reading progress. When a young student exhibits difficulty with learning to read, dyslexia should be suspected and the child tested to find out if he has this problem. Once a student is identified as having dyslexia, a set of strategies can be employed to help that child learn to read. Luckily, having dyslexia does not mean a child can't learn to read, and teachers should know that the approaches and tools they use to help the dyslexic child learn to read will also benefit their other students. 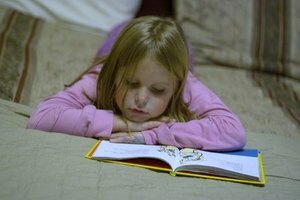 Young children tend to learn best by using all of their senses, and dyslexic children in particular are able to make reading gains if they are taught through a variety of avenues. Make the experience of reading a text not only verbal, but use visual cues and hands-on experiences as well to help the student engage with the text. Create an environment in which the child is surrounded by language, both written and spoken. When you read aloud to the dyslexic student, read slowly and choose texts that rhyme to increase word and sound repetition. Give the student pictures to color in that relate to the story to help him physically engage with it. Use flash cards to help the child begin to recognize sight words. A student who is identified as having dyslexia most likely has a 504 plan or an individualized education plan that outlines classroom and other types of accommodations the child requires to support his learning. It's important for teachers to ensure that accommodations are followed. Accommodations may include giving the student an audio version of a book to listen to while reading along in the print version, allowing the student to read aloud one-on-one privately with the teacher instead of in front of the whole class, or loaning the student a set of classroom books to take home so he can practice reading outside of school. Learning to decode written language and memorize sight words are basic skills all beginning readers must acquire, but these skills come more slowly for the dyslexic student. Putting together written words to make meaningful sentences and texts is where reading comprehension and fluency come into play. Pre-reading steps can help to support a child's understanding of a text and his eventual ability to read it with some fluency. Allow the child to choose a book to read aloud; ask him to find something about that book that looks interesting to him. Talk to him about what he thinks the book may be about. As the child reads, he may be so focused on reading each individual word that he loses track of the overall story. Ask him questions from time to time to help him clarify what is happening in the text he is reading. Reading aloud often, repetition of words and drilling to help memorize words all contribute to improved reading fluency. Helping a dyslexic student feel self-confident can improve his chances for reading success. One way to boost a child's confidence is by identifying his strengths and tapping into them to help develop his reading skills. If the child loves doing artwork, ask him to make his own book with illustrations and written words. A musically inclined student can write his own songs, perhaps using sight words he is learning as part of the lyrics. Look, too, for such strengths as a good memory and organizational ability and use those to help shape a reading program. The Yale Center for Dyslexia and Creativity: I have Dyslexia. What Does it Mean? Beacom, Betsy. "How to Teach a Dyslexic Child to Read." Synonym, https://classroom.synonym.com/teach-dyslexic-child-read-4442238.html. Accessed 19 April 2019.